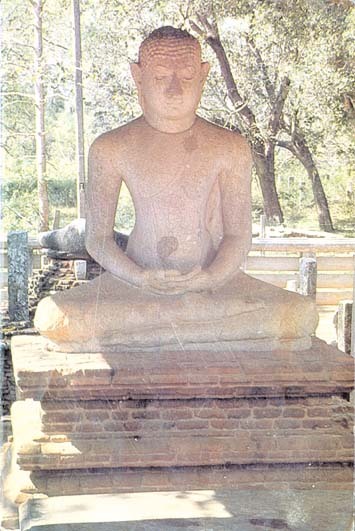 This Pilima Vahanse is said to belong to the Abeygiriya period of the 3rd or 4th century of Sri Lankas history. It is not known in whose period of rule it was sculptured but is thought to be one of four similar statues facing the North, South, East and West- this faces North. The statue was found in 1888, with the nose damaged, at the very site it is now in. Raven Hart in his "Ceylon - History in Stone" says that the repaired nose is oversharp and overlarge. Perhaps the repair was carried out by an ordinary mason who had no idea of proportions or aesthetics. This is not unusual, as there are many such instances of poor quality repairs in this country of damaged statues, stone carvings and particularly restoration of ancient temple paintings. The Statue is 73" in height, hewn from a single granite rock and said to have had two jewels for the eyes which are said to have gone missing in around 1914.The veracity of this is in question as the eyes are closed with no place for jewels. The canopy over the statue was constructed in 1959/60. Ananda Coomaraswamy wrote that the statue is "certainly the created work of art in Ceylon and is not surpassed in India"
Jawaharlal Nehru admired it when he first saw the statue in 1931. A year later when he was in the Dehra Dun gaol a friend in Ceylon sent him a picture which he had with him in his cell and " it became a precious companion" he said. Benjamin Rawland in his book "Art and Architecture of India" describes the statue as "The perfect embodiment of the idea of Samadhi is conveyed through the very simplicity of conception; the perfect material equilibrium of the figure connotes the perfect mental state of the Sakyamuni through the massive stability of the triangular base formed by the inter locked legs mounted by the erect column body which supports the perfectly impassive mask like face." The Samadhi statue is symbolic of the tranquillity of mind, with no attraction or repulsion from the world out side to disturb.